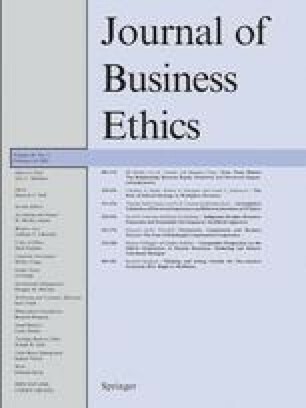 Ethical ideology is predicted to play a role in the occurrence of workplace deviance. Forsyth’s (1980) Ethics Position Questionnaire measures two dimensions of ethical ideology: idealism and relativism. It is hypothesized that idealism will be negatively correlated with employee deviance while relativism will be positively related. Further, it is predicted that idealism and relativism will interact in such a way that there will only be a relationship between idealism and deviance when relativism is higher. Results supported the hypothesized correlations and idealism and relativism interacted to predict organizational deviance. Idealism was a significant predictor of interpersonal deviance, but no interaction was found. Christine (Chris) A. Henle, Ph.D. is an assistant professor of Management at the University of North Carolina at Charlotte. Her research interests include counterproductive employee behaviors, employment law, and organizational justice. Her current research focuses on cyberloafing at work, religious discrimination in employment, and the role of supervisor and coworker norms in predicting counterproductive work behaviors. She has provided consulting services in the areas of job analysis, recruiting, selection, and performance management. Robert A. Giacalone, Ph.D. (State Univeristy of New York-Albany) is Professor of Human Resource Management at the Fox School of Business and Management, Temple University, in Philadelphia, Pennsylvania. Dr. Giacalone is coeditor of five books, co-author of two books and has authored over 90 articles on ethics, employee sabotage, impression management and exit interviewing, appearing in journals such as Human Relations, Business and Society Review, Journal of Business Ethics, Journal of the Organizational Behavior, and the Journal of Social Psychology. His current research focuses on the impact of materialism/postmaterialism and workplace spirituality on business ethics. Carole L. Jurkiewicz, Ph.D. is the John W. Dupuy Endowed Professor and the Women’s Hospital Distinguished Professor of Healthcare Ethics at Louisiana State University. Her publications include a wide array of scholarly articles, books, and the general press. She maintains an active consulting practice in the areas of organizational psychology, ethics, and leadership.